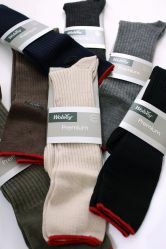 Morley/Wolsey Classic Cotton Rich Rib Socks - 2 pair pack. Combed cotton blend yarns give our socks a luxurious soft handle you can really feel. Last remaining stock, order quickly before they are gone. Made by Wolsey, the new Morley Brand offers the same or better quality. Actually it is not a new Brand, it was established in 1875. The image still shows the product with a Wolsey label, but it may be delivered in the new smart Morley or Wolsey finery. 74% Combed Cotton 24% Polyamide 2% Elastane. Available in Black, Navy, Grey, Stone, and Khaki green. Also available in assorted colour 3 pack for the same price as a 2 pair pack. (Special offer - limited stocks available). Available in UK size 7-12. (Euro 40-45).